The high performance wireless platform. It has four miniPCI slots and three gigabit ethernet ports and it is the the fastest from our wireless routers. 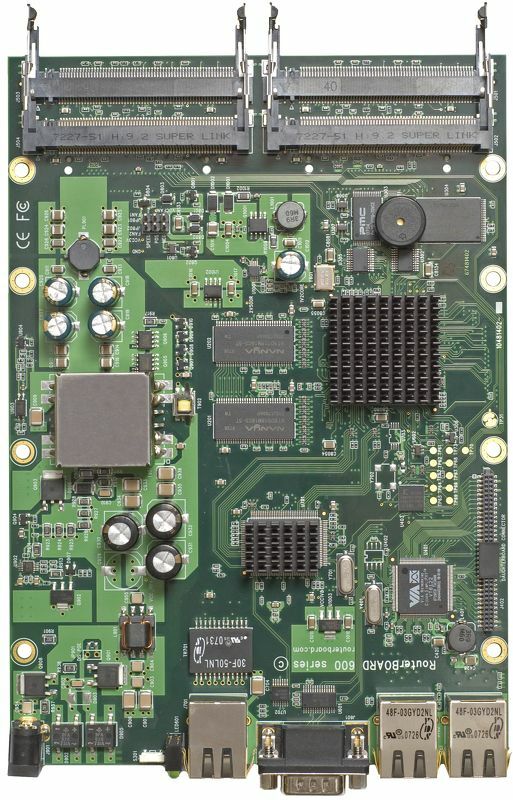 The heart of this device is the state of the art PowerPC CPU which makes the RB600 faster than any other MikroTik product, introducing a whole new class to the RouterBOARD brand. Two Compact flash slots for webproxy cache and configuration backups of the User Manager database or The Dude server. RB600 includes RouterOS - the operating system, which will turn this powerful system into a highly sophisticated router, firewall, bandwidth manager or hotspot. It is also the only RouterBOARD with 48V DC support. Your definitive choice for an expandable gigabit system.